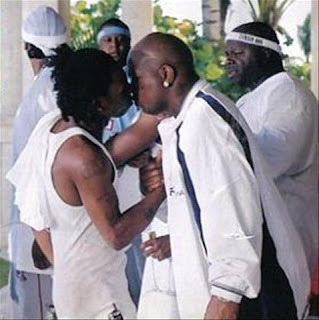 From the who's lickin who's lollipop department... Lil Wayne & Birdman @ Travis County Expo Center on July 10, 2008! Get tix @ Front Gate Tickets here. More details here! One thing I learned on the bachelor trip, the oldest profession in the world is alive and well. Dwayne Michael Carter, Jr. (born September 27, 1982), better known for his stage name Lil Wayne, is an American rapper. He met the Cash Money Records collective as a teenager and eventually recorded for the label. He was a member of the rap group, Hot Boys. Today he is one of the best-selling rappers in the world, which has brought him praise as well as disdain. He was born Dwayne Michael Carter, Jr. and grew up in the Hollygrove neighborhood of New Orleans, Louisiana. Dwayne was in the gifted program at Lafayette Elementary School, and was in the drama club in middle school. At age eleven, he met Bryan Williams, rapper and owner of Cash Money Records. Wayne recorded freestyle raps on Williams' answering machine; Williams would eventually mentor the young Wayne and include him in Cash Money-distributed songs. He dropped out of school at age 14. Wayne had a daughter named Reginae Carter with Antonia "Toya" Johnson, his high school sweetheart. The two later divorced. In an interview with Blender, Wayne revealed that one of his favorite bands growing up was Nirvana, including their song "Smells Like Teen Spirit".